Looking for a tool that has the capabilities to create collages, scrapbooks, posters, invitations, calendars, and greeting cards? Look no further, this cool collage maker serves your purpose. Picture Collage Maker Pro is a fun and simple-to-use Windows program that turns ordinary photos and pictures into stunning keepsakes to share with family and friends. With just a few clicks, you can create Photograph Collages, Scrapbooks, Calendars, Greeting Cards, Poster, Photo Books and any other photo-related artwork that you can imagine. If you’ve ever tried to create a photo collage in Photoshop, you’ll find how time-consuming it could be. Unlike Photoshop and many other photography software, Picture Collage Maker Pro has an efficient interface and easy to use features. It lets both seasoned collagers and new hobbyists become productive in minutes. 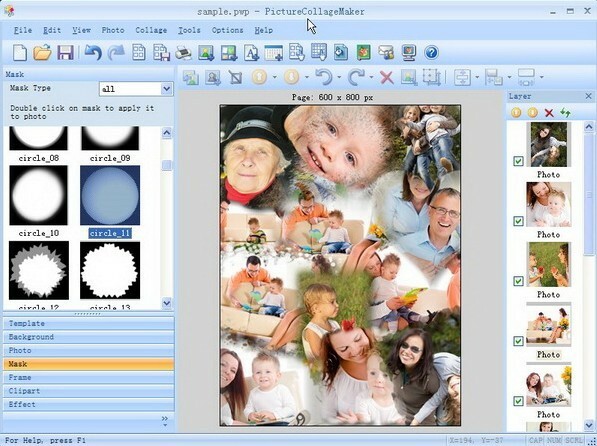 Picture Collage Maker Pro comes with a library of over 100 professionally-drawn templates, all of which are easily accessible by scrolling through a thumbnail menu on the program’s main screen, at the same time it also gives you the choice of creating collages from scratch – which makes it suitable for both beginners and advanced users. Furthermore, Picture Collage Maker Pro also includes a built-in editor, a complete tool where you can fine-tune your collage by adjusting hue and brightness, and applying artistic effects. When you run the program you are prompted with the following window, just follow the wizard and you’ll have your own custom collage in a few simple steps. 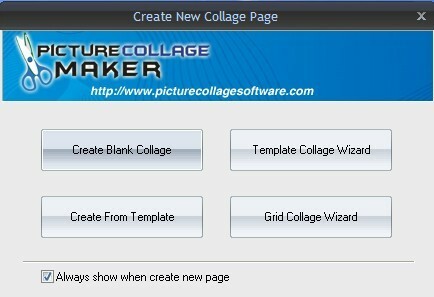 Create Blank Collage – choosing this option allows you to create a collage from scratch. Grid Collage Wizard : Making a collage is not only a means of preserving the memories of today for the future, but it’s also a creative craft. There are thousands of methods online for you to make a picture collage as you want. Using Grid Collage Wizard can be a simple method to keep this meaningful and wonderful moment in memory. It is different with other collage making programs because of the brief method of adding many photos in a single step. Create From Template – choosing this option allows you to select from a library of over 100 professionally-drawn templates that offer you a wide variety of photo layouts and backgrounds for your collage. When you are satisfied with your collage, You can save your project for future updating, save it as a jpeg file (if you have a mutli-page collage each page will be one image) to send to your friends, or turn it into a template that you can use as the basis for future collages. You can even make your collage your Windows wallpaper. Try Picture Collage Maker Pro now and transform your special pictures into precious memories! Download Picture Collage Maker Pro From here. For Photo Collage Samples and any other Resource, please visit the product home page. People who are unable to find the information they need in the tutorials or frequently asked questions can contact the technical support team for further assistance. In cooperation with PearlMountain Soft (developer of Picture Collage Maker and sponsor of this giveaway), we can offer 20 license code to activate the Full Version of Picture Collage Maker Pro, each worth € 39,90. 1, subscribe to Out blog by email. then write a short comment in this post. The Giveaway start from now to 16th. Jan, 2011, 12:00 PM GMT. I will announce the winners on 17th. Jan, 2011. Lucky winners will be selected randomly according to random.org. Wish you good luck. Updated: Since there are only 12 users participate in this Giveaway, all participants are winners. The free license code for Picture Collage Maker Pro has already been sent to your email, please check for it. Thanks Shelley from PearlMountain Soft. Thanks for this wonderful giveaway sir.i would really love to get a key of this software.please count me in. Hi, can I still get a license key , please give me, thanks. please give me, licence code,,,sir…. Hi, aulia: Your free license code has been sent to your email. Please check for it. With best regards. Hi, I know this has been over for a loooong time, but was wondering if there was any way I could get a licence code. I took the pictures at my stepson’s wedding and want to make a collage wedding book album for him. Have heard this is a great collage maker software. @Charla, we are going to giveaway a similar software, CollageIt for Mac. Please keep tuned if you are interested. Hi, basel: Your free license code has been sent to your email. Please check for it. With best regards. Is it still too late ? @Avatea: Yea, a little late. But you are lucky that there is still few license keys left. I have sent one to your email. Please check for it. @All: All participants are winners! License code have been sent to your email, please check for it. I don’t know, is this train all gone or await for me too. I’ll be intrested about, but maybe late? great giveway. count me in. Looks cool.really wanna try one. feel lucky if i got that code ,sir please count me.. thanks in advance. I like it. thank you for share! Hey, please count me in the draw! I have tried before unsucessfully to win this software and would really love to win a license. Thanks for setting up this give-away! Wow great giveaway !!! I really hope I get lucky and win this software. Great stuff !!! 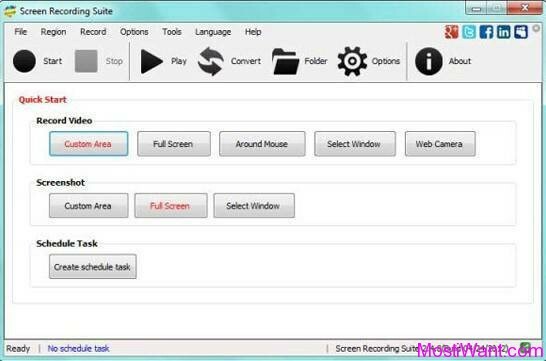 I have used that software before and it is just awesome.